I’m late to the party here but sailing through a sea of pumice deserves comment. Yesterday CNN.com International reported (also picked up by About: Sailing) on a boating blog kept by the crew of the Maiken enroute from San Francisco to Australia. On the passage east of Fiji the boat sailed through an ocean of floating stone and took pictures. The following day they sited a volcanic island rising from the sea and sailed close to photograph it. Frankly, closer than I might considering the amount of pumice they sailed through the previous day. I haven’t yet read the blog but the photos are phenomenal and well worth viewing. Wake through a sea of pumice. I first sailed the Caribbean with friends on a Christmas holiday twenty years ago. We chartered several boats out of Marigot Bay, St Lucia, and sailed down the Leeward Islands to the Tobaggo Keys, then back again. Our first night was spent at anchor off the village of Soufriere, in the shadow of The Pitons–a pair of extinct volcanoes that rise abruptly from the sea– with our stern line secured to a palm tree. The Pitons, seen from Soufriere. I later learned, in a bar built of rough planks that sprawled across the sand almost to high water, that an elephant had once freely wandered the beach at Soufriere. The elephant had a history involving a bankrupt zoo and a local plantation owner and it was allowed to wander freely until it realized where the bananas went at night, the same bananas that sailors fed it during the day. The elephant developed the disconcerting habit of hauling the sailors and their boats ashore using the stern lines tied to palm trees. I’m told it was very gentle but insistent. 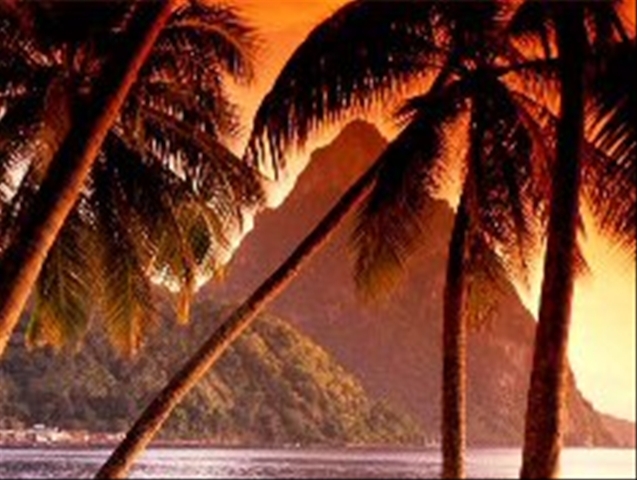 That first night at Soufriere we were still sailors escaped from a cold, wet San Francisco winter. It was impossible that we wouldn’t go ashore immediately in search of a bar. It was dark by the time we rowed ashore, a moon-dark night filled with stars broadcast like sand across the sky. We beached the dingy beneath a copse of palm trees illuminated by fire flies. I had never seen fire flies and chased them through the dark until I almost tripped over a headstone. We had landed in the local graveyard. Within our first five minutes ashore we had managed to desecrate the dead. There were no street lamps in Soufriere, no neon, not even a naked light bulb suspended from a frayed cord. Apparently the local power utility closed at 9 pm to conserve fuel. Lantern light spilled from an open doorway. 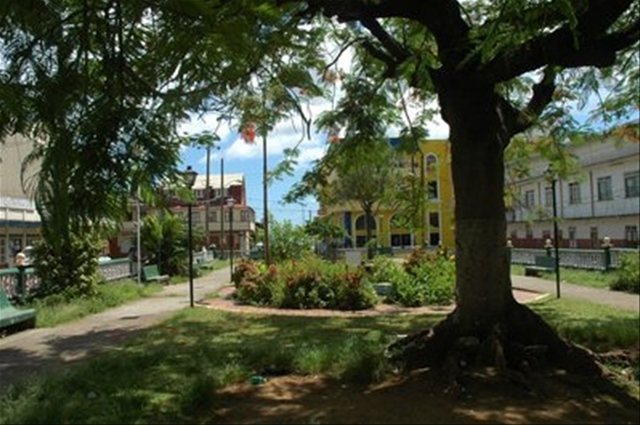 Town square, Soufriere, St Lucia. There wasn’t a white face among the men who sat at scarred tables with mismatched chairs but there wasn’t a sense of threat, either. The bar tender stood behind a kitchen counter that was once painted bright red. He served us rum in water glasses, no two alike, and ice chipped from a monolithic block. The Caribbean heat dripped from us all, black and white, and puddled on the table tops. Occasionally someone would laugh at another man’s joke and his face would split like the sun splitting clouds—brilliant white teeth and laughter. From Soufriere we sailed south along the Grenadines to the Tobaggo Keys, sheltered behind a fringing reef from waves that fetched all the way from Africa, and competed with the two other boats in our flotilla to make the best cocktail from ingredients at hand. Who knew you could mix tea with almost anything alcoholic? On our return to Marigot Bay we stopped again at Soufriere. I had money enough to eat or drink but not both. Like a good sailor, I drank. By the time the rest of the crew found me in the beach bar, I was well advanced. I’m not sure who first mentioned the elephant but it was a young local who offered: Would you like to see the elephant? Even in my less than sober state it sounded dubious but asking a drunken sailor if he’d like to meet an elephant is like asking the Pope if he’s Catholic. Only one answer is possible. Following a kerosene lantern through a moonless night across broken ground is a challenge when you’re three sheets to the wind. It was like running down a steep hill, head-butting gravity. I smelled the elephant before I could see the dark stone barn where it lived. It was a pungent, earthy smell but inoffensive, like the smell of the African savannah, I imagine. Our young man led us to a stone wall and a corbelled window without any glass. Inside it was utterly dark. (Pretty damned dark outside, too.) I could hear the rush of air from the elephant’s breath, smell straw and musk and rotting vegetation, but I could see nothing. Emboldened by rum, I offered my hand to the darkness. I hadn’t expected a response. The elephant’s trunk seemed simply to materialize. It twined around my wrist like a snake and held me firmly but gently. I’m sure I would have jumped ten feet if I weren’t held in place. It sampled my smell and found, yes, I had no bananas, then lost interest. I could easily imagine the caption from an article on page 56 of the San Francisco Chronicle: “Drunken sailor mauled by elephant on Caribbean island.” Of course, the animal rights activists would be outraged. The rest would probably wonder if elephants were indigenous to the Caribbean, then quickly move on to the sports section. 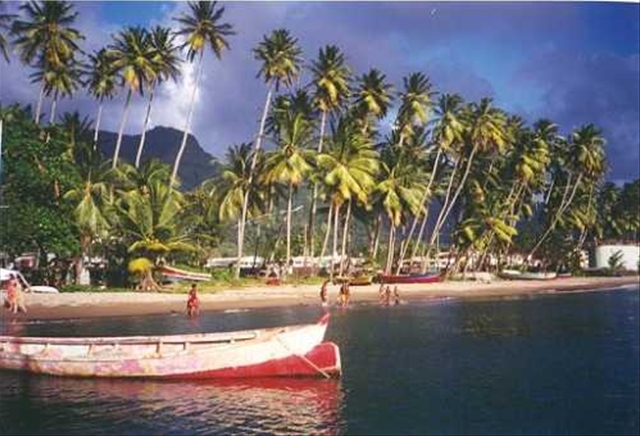 The beach at Soufriere, St Lucia. We regained the beach unharmed but broke. We launched the dinghy on an ocean full of stars but halfway back to the boat someone noticed the water level rising rapidly. We had failed to reseat the plug after draining the dinghy ashore and were knee deep in seawater. After a great deal of laughter and more than a few scurrilous comments about our seamanship, we were rescued by our mates.